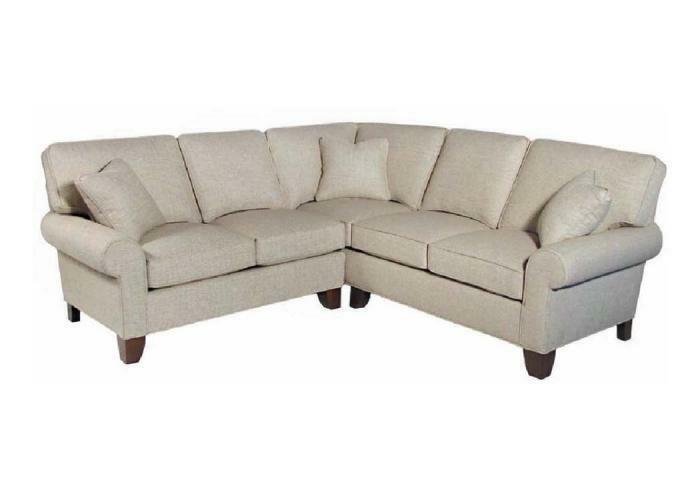 The Madison sectional by Hallagan Furniture features the most customizable upholstery with the most consistent, and durable construction, you can buy. This collection gives you the choice to select from 3 different seat depths (short, medium, or deep), 3 different arm designs (rolled sock, rolled scoop, and wide track), 3 different shapes to the cushioned back (rounded knife, rounded box, and straight box), all with the choice of loose or semi-attached, and multiple base design options, and all of these choices are available with no upcharge!! The benchmade seat construction features an open coil design that is hand tied in eight different directions and then secured into place with a webbing and steel band. This labor intensive construction is the oldest and most durable internal construction made and is designed to give this sectional years of consistent support and a lasting durability no matter how often it is used. Hallagan Furniture has been making custom upholstery in New York State for more than 120 years. They are recognized as a leader in 8 way hand tied construction which has been the oldest and most consistent upholstery construction available today. Specializing in creating the perfect custom upholstery, their delivery averages 30-40 days to your home.